Every year for my birthday Andy asks me what I would like for my present, this used to bother me, as I thought he should know me well enough to know what I would like. But, I have come to realise over the years that it’s not about him not knowing me well enough, he knows me better than I know myself. It’s just that he worries about getting me something that I don’t like. Plus he knows that since having the girls I don’t treat myself like I used to and there is probably a lot of things I dream over buying. It’s my birthday in a couple of weeks, in fact it has fallen on Fathers’ Day this year, which I have cancelled this year in our house! So, I was looking for things to put on my list of what I would like. I normally give him a few suggestions so I can have a bit of a surprise and I thought I would share it with you. Always with Love by Giovanna Fletcher – I have read all of Gi’s books and they are brilliantly written. I can’t wait to read her new one that came out last week. Stella Bucke Shopper from Oasis – I am going to hold my hands up and admit I have a handbag addiction. I love this one and I thought it would be perfect to take to the BritMums Live conference which is the week after my birthday. Chelsea Frill Top from Oasis – I spotted this top when I was looking for a new bag. I normally play it safe with colours that I wear and I don’t actually think I own anything red. But, this really caught my eye and I love the design. Wild Blossom A5 Fabric Bound Notebook – Ok, so I may have another addiction…stationery! I just love a notebook for all the lists that I love to make. It has got worse since I started blogging because I have one for lists and one for ideas, not to mention the one for everyday lists and holiday lists. I adore this Wild Blossom notebook, inside is a faded version of the pattern. Do you make a list for your birthday? 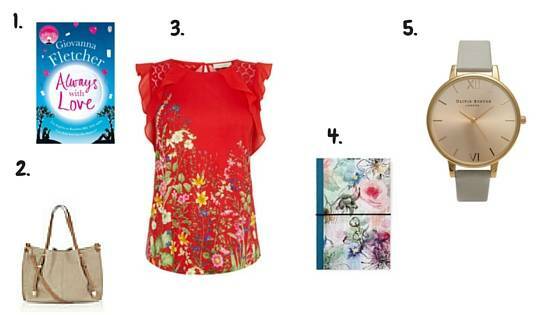 The Oasis top and the wild blossom notebook are my favourites. I hope you have a great birthday! Oh I really love that top, it’s so pretty. I am also a bit of a self confessed stationery addict! I hope you have a fabulous birthday. I think that red top would look great on you! It’s my 30th next year, and whenever I mention something expensive that I would like in passing, Carl just says, well you’ve got a big birthday next year…, so next September I’m expecting a MacBook, a canon g7x, a new lens for my dslr…. Hahahaha yeah right! Love the bag, I always seem to have my birthday when we are abroad so I don’t really get much other than a couple of CDs or something easy to carry. This year I have no idea what I’d like, maybe some perfume? Oh my gosh that top is stunning! I feel a little trip to Oasis is in store. I’ve never read one of G’s books but one of my friend adores her and has been recommending them to me so maybe I should stick up on my kindle. The Olivia Burton watch is so gorgeous. I love the strap and the rose gold clock face is perfect. Fantastic birthday wish. I would love to get a hold of Olivia Burton watches it looks stunning. Lovely wish list! Another stationary addict here! I always give my hubby a list too, in fact I’m already thinking about Christmas, hehe! Lovely choices 🙂 I have recently started using Amazon to do my wishlists, I love it you can even add things from other sites and then casually make sure everyone sees your amazon wish list before your birthday 😉 crafty ha!